Carpet can be repaired. Burns, pet damage, ripples and waves can all be remedied by a technician with the right tools and skill. We have certified repair and re-installation technicians on staff to handle any special repair projects. 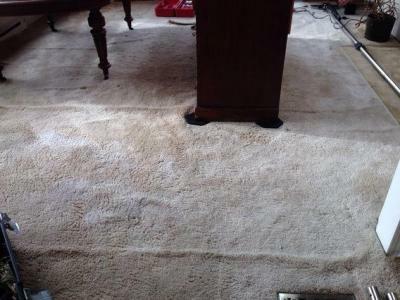 Are you in need of carpet repairs –possibly even carpet re-stretching. It is usually not the fault of the carpet if it wrinkles sometime after installation. Today’s carpets need to be power stretched with a machine – not just knee kicked as I’m sure many people have seen. Power stretching is done with a machine that spans your room and can put the proper stretching force into the carpet. According to the carpet and rug institute all new carpet installations must be power stretched however in reality – many are not. Stretching a carpet may not be as simple as it seems and in most cases we like to do a visit first to determine the extent of work required. Some of the variables are –do we need to re-do seams, how much furniture do we need to shift around, are closets involved, condition of the carpet etc. When you hire us to do your repairs, you’re hiring an ethical insured company who takes pride in our work and will not take short cuts to give a sub-standard repair. How good would you think we were if 6 months after we stretched your rooms – the wrinkle comes back. Probably not very good!! For that reason we insist on using power stretchers. It takes longer, it costs a little more but at least we can guarantee it is permanent. Our 12 years in business and lots of referral business speaks for itself. Our specialists that perform this work are company employees, trained by us and certified in carpet cleaning as well as repairs. You’ll feel comfortable with them in your home. They are uniformed and will always be polite. We guarantee this. So whether it is wrinkles in the family room, bleach damage in the living room, runs in the Berber carpet, burns in front of the fireplace, repairs to a cat scratched corner or any other repair need, let VICTORIA CARPET CARE do it for you. Call 250-474-7777 for your FREE quote.